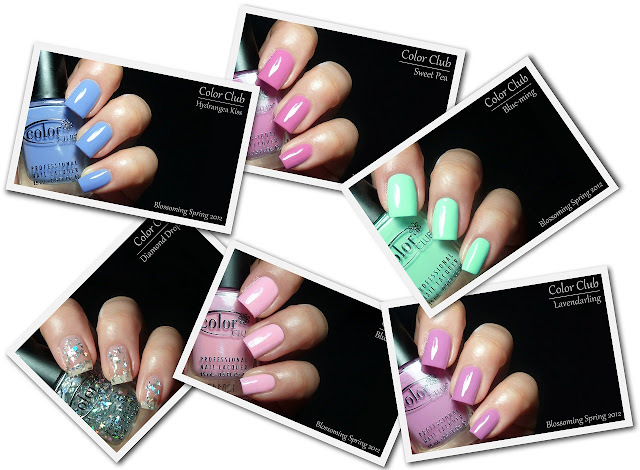 While Color Club Summer collection was all about saturated colors and sparkle, Spring is more about soothing pastels. I probably should have posted this a long time ago but sometimes life gets in the way, you know... I really hope you'll enjoy them anyway! Blushing Rose. Soft bubble pink. This is fabulous in the bottle but not so much formula wise. Whenever I have a collection to swatch, I always start with the lightest polishes and Blushing Rose really got me worried about the rest of them. It's just so uneven! I applied 3 coats here and I'm not fully satisfied with the result, a fourth one might have been necessary but I just couldn't bring myself to do it. You better be dang special to justify 4 coats! Sweetpea. Dusty pink-purple or purple-pink. I love this pink, it's really different from the usual releases. Formula was surprisingly nice, especially after Blushing Rose. Sheer but even on the first coat, fully opaque on the second. This is 2 coats plus topcoat. Lavendarling. From the promo pictures, I expected it to be a true lavender but it's definitely much warmer than that. It's one of those purples that must be color corrected ot it'll appear way too cool toned. Formula was great, 2 coats plus topcoat here. Blue-ming. This is more mint green than blue or turquoise to me. Formula was thicker than the previous colors but very manageable. Two coat plus topcoat here. Hydrangea Kiss. Dusty periwinkle blue creme. No matter how many periwinkles I have, I can't seem to get enough of them! I absolutely love this shade and formula was as great as the purples. Two coats plus topcoat too. Diamond Drops. A very unusual holographic topcoat. Shredded, multi-sized, irregularly shaped, pieces of holographic sheets in a clear base. It reminds me a lot of Cult Nails Happy Ending only as a holo version. 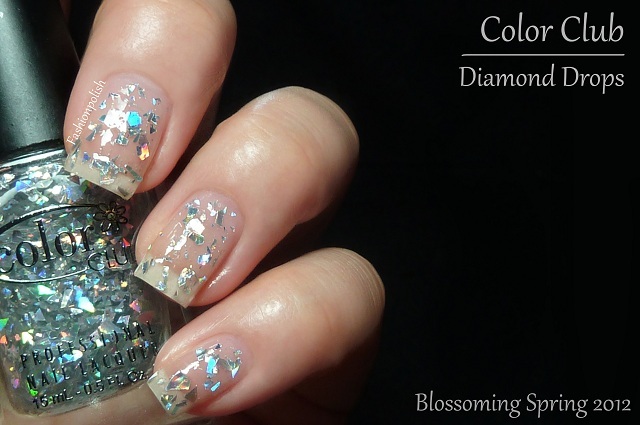 I don't think you could achieve full opacity with Diamond Drops no matter how many coats you applied. Formula was a bit goopy, as expected, but not unmanageable. This is 2 coats plus topcoat, no underwear. 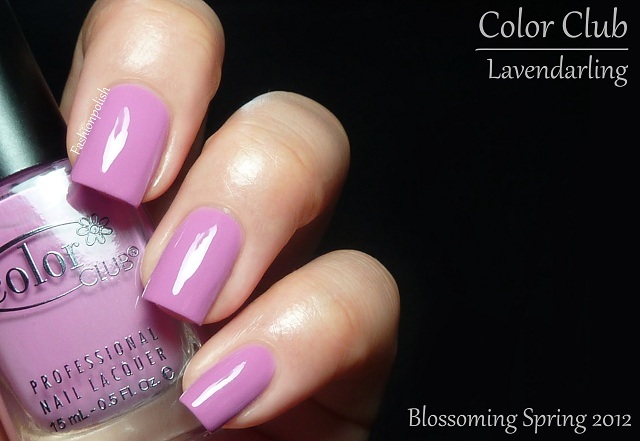 Color Club Blossoming is a very nice, Spring appropriate, collection. I'm really loving most of these shades, especially Diamond Drops which is surprisingly wearable. I'd definitely leave out Blushing Rose (too much of a hassle to apply in my opinion) but the others are beautiful pastels. Did you pick any of these? What's your favorite pastel color to wear? I have a really beautiful lilac/pastel purple from Revlon. It's from the Colorstay series and it's called 040 Provence. You should check it out! @Samantha L thanks for the rec' Samantha! It looks fab! Blue ming is my fave! I love your new pictures! They are really pretty :) Think Blushing Rose would behave if you applied a coat of white first? I had such trouble with Blue-Ming. It was my first Color Club. Looks like I should give them another shot. I got Hydrangea Kiss, and then I came back for Blue-ming and it was sold haha! Well i have a lot of pastels so I think I didn't "need" it! Your swatches are gorgeous and make me want to have every polish I see on you!